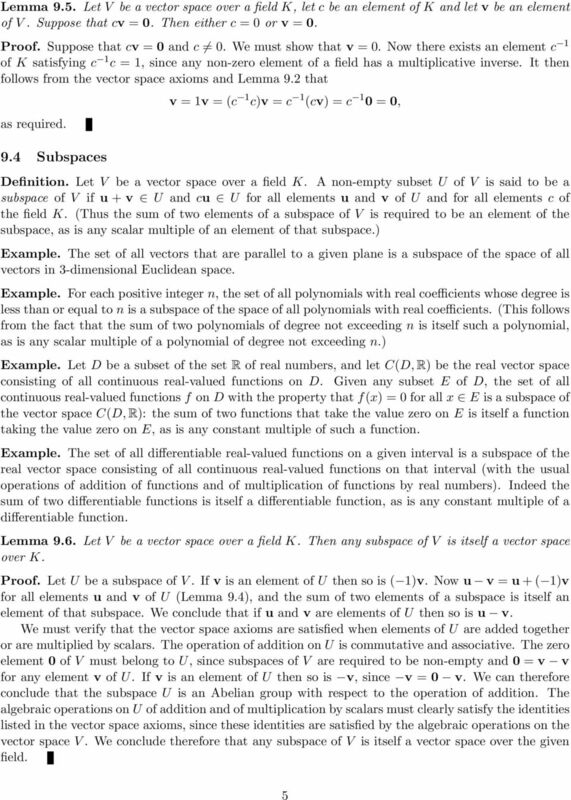 Download "Mathematics Course 111: Algebra I Part IV: Vector Spaces"
8 Proposition 9.8. 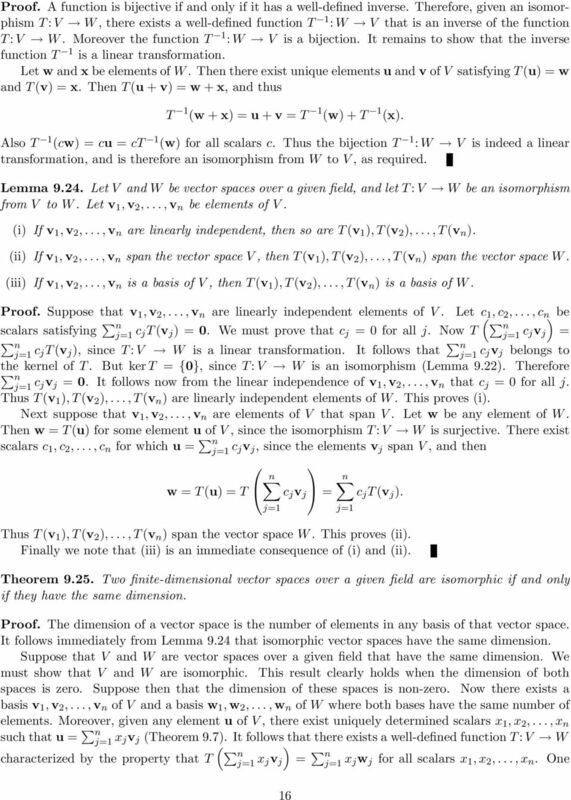 Let V be a non-trivial vector space, and let S be a finite subset of V whose elements span V. Let n be the smallest positive integer for which there exists a set of n elements of S that span V. Then any n vectors of S that span V are linearly independent, and thus constitute a basis of V. Proof. Let v 1, v 2,..., v n be n elements of S which span V. We show that these elements are linearly independent. 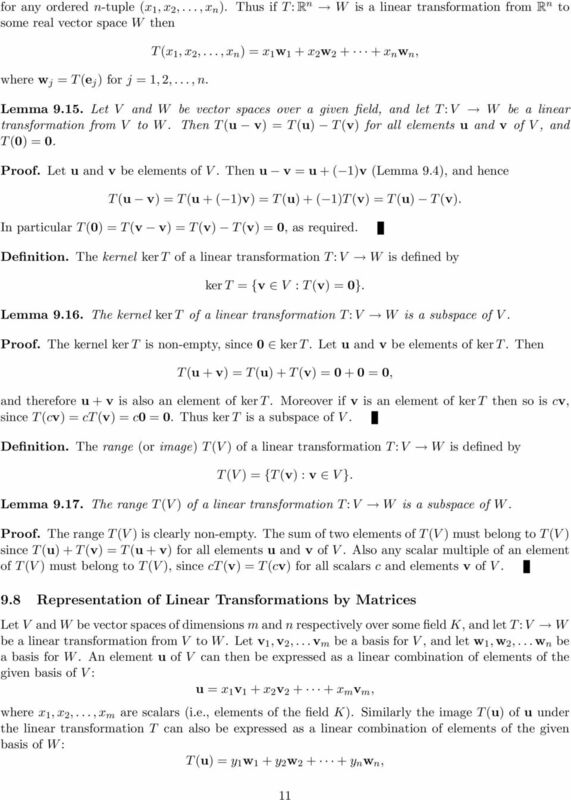 Suppose that v 1, v 2,..., v n were linearly dependent. Then n > 1, and there would exist scalars a 1, a 2,..., a n, not all zero, such that a 1 v 1 + a 2 v a n v n = 0. We may suppose, without loss of generality, that a n 0. Then v n = b 1 v 1 + b 2 v b n 1 v n 1, where b i = a i a 1 n for i = 1, 2,..., n 1. But then v 1, v 2,..., v n 1 would span V, since any linear combination of v 1, v 2,..., v n could be expressed as a linear combination of v 1, v 2,..., v n 1. 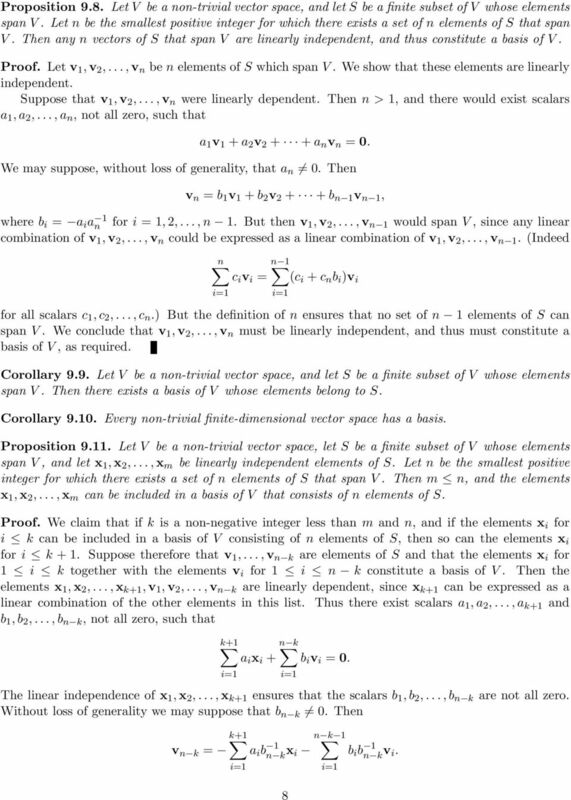 (Indeed n n 1 c i v i = (c i + c n b i )v i i=1 i=1 for all scalars c 1, c 2,..., c n.) But the definition of n ensures that no set of n 1 elements of S can span V. We conclude that v 1, v 2,..., v n must be linearly independent, and thus must constitute a basis of V, as required. Corollary 9.9. 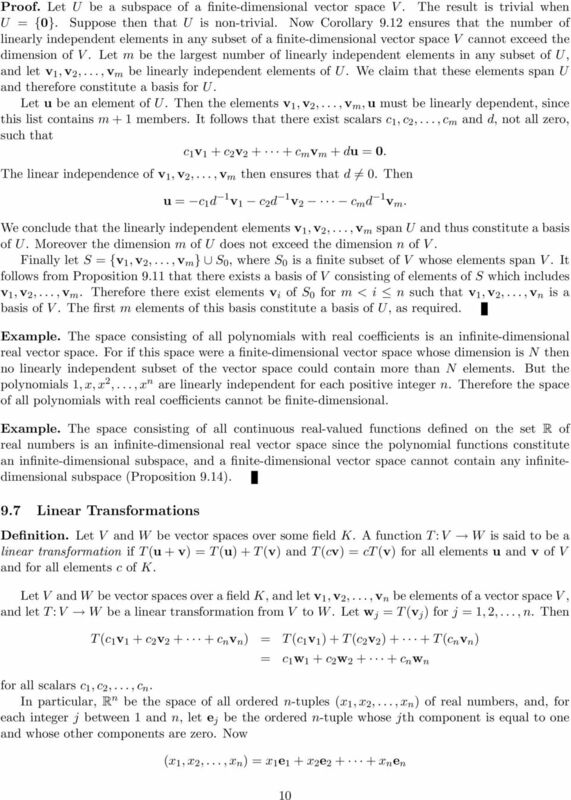 Let V be a non-trivial vector space, and let S be a finite subset of V whose elements span V. Then there exists a basis of V whose elements belong to S. Corollary Every non-trivial finite-dimensional vector space has a basis. 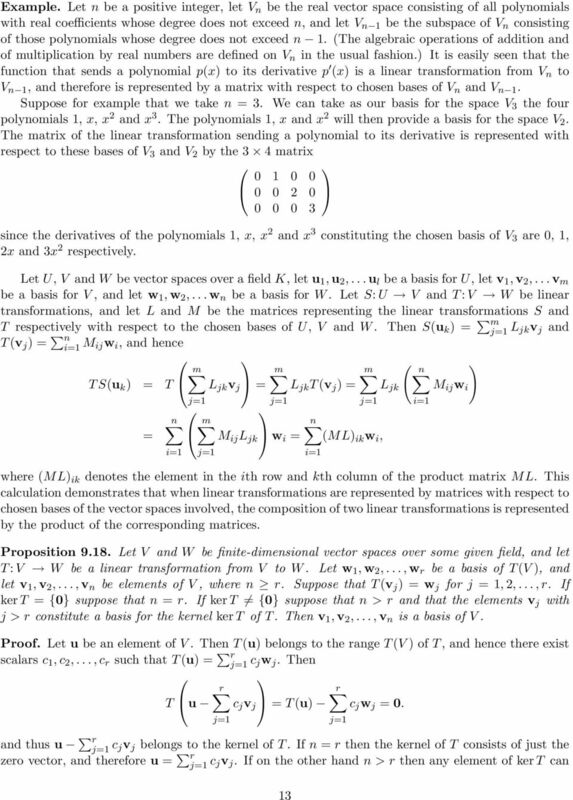 Proposition Let V be a non-trivial vector space, let S be a finite subset of V whose elements span V, and let x 1, x 2,..., x m be linearly independent elements of S. Let n be the smallest positive integer for which there exists a set of n elements of S that span V. Then m n, and the elements x 1, x 2,..., x m can be included in a basis of V that consists of n elements of S. Proof. We claim that if k is a non-negative integer less than m and n, and if the elements x i for i k can be included in a basis of V consisting of n elements of S, then so can the elements x i for i k + 1. 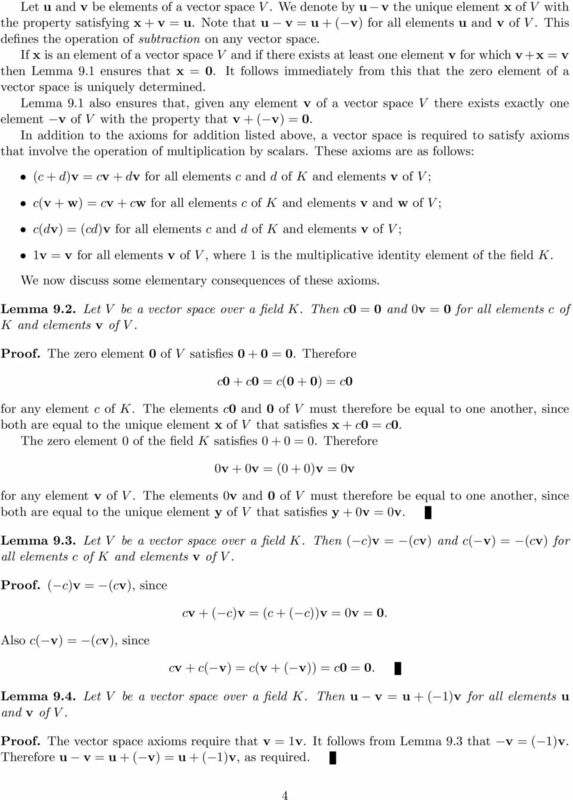 Suppose therefore that v 1,..., v n k are elements of S and that the elements x i for 1 i k together with the elements v i for 1 i n k constitute a basis of V. Then the elements x 1, x 2,..., x k+1, v 1, v 2,..., v n k are linearly dependent, since x k+1 can be expressed as a linear combination of the other elements in this list. Thus there exist scalars a 1, a 2,..., a k+1 and b 1, b 2,..., b n k, not all zero, such that k+1 n k a i x i + b i v i = 0. i=1 i=1 The linear independence of x 1, x 2,..., x k+1 ensures that the scalars b 1, b 2,..., b n k are not all zero. Without loss of generality we may suppose that b n k 0. Then k+1 v n k = i=1 n k 1 a i b 1 n k x i 8 i=1 b i b 1 n k v i. 1 Sets and Set Notation. 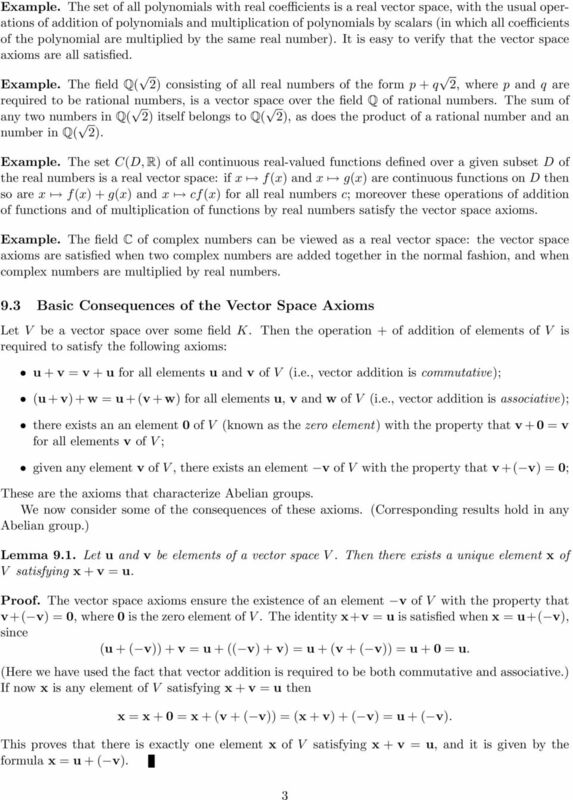 These axioms must hold for all vectors ū, v, and w in V and all scalars c and d.
MATH 304 Linear Algebra Lecture 18: Rank and nullity of a matrix. 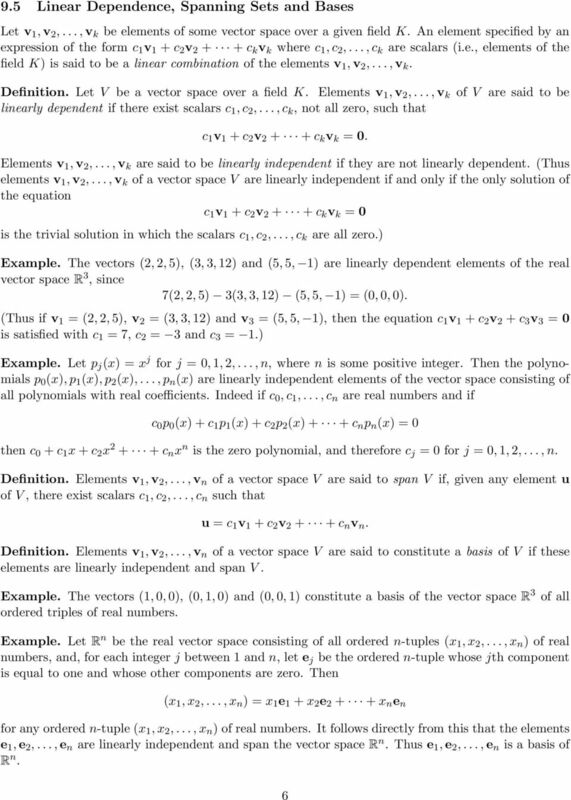 Linear Algebra I Ronald van Luijk, 2012 With many parts from Linear Algebra I by Michael Stoll, 2007 Contents 1. 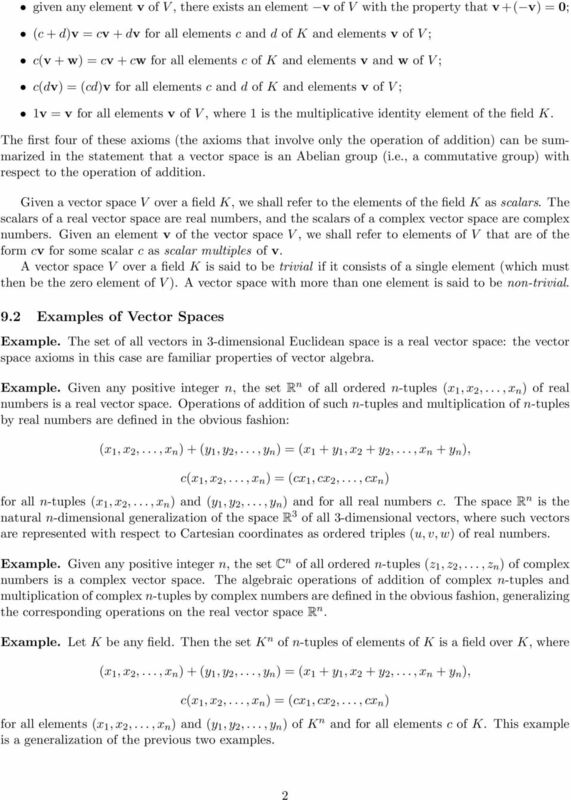 Vector spaces 3 1.1. Examples 3 1.2. Fields 4 1.3. 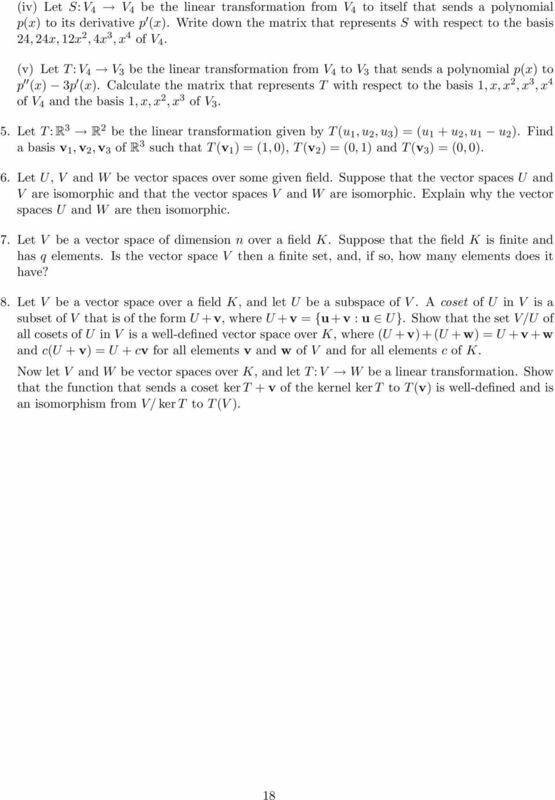 The field of complex numbers. 6 1.4. T ( a i x i ) = a i T (x i ).
. 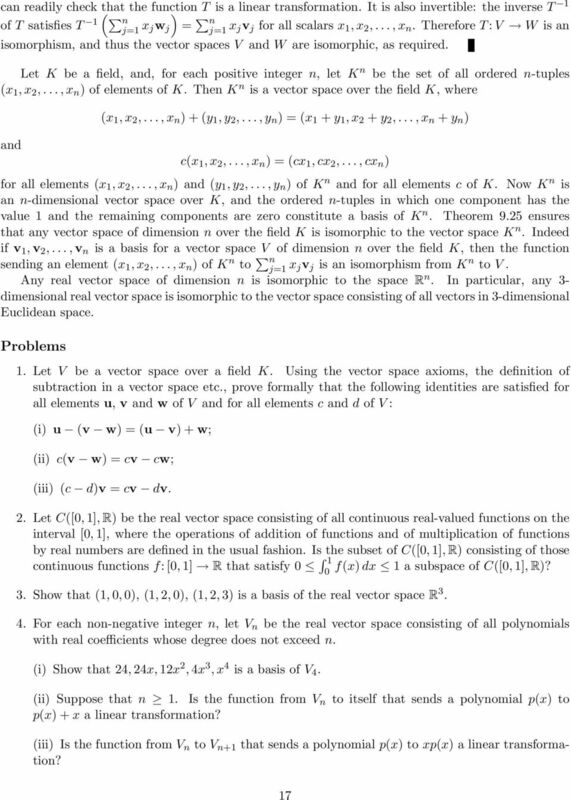 INNER PRODUCT SPACES.. 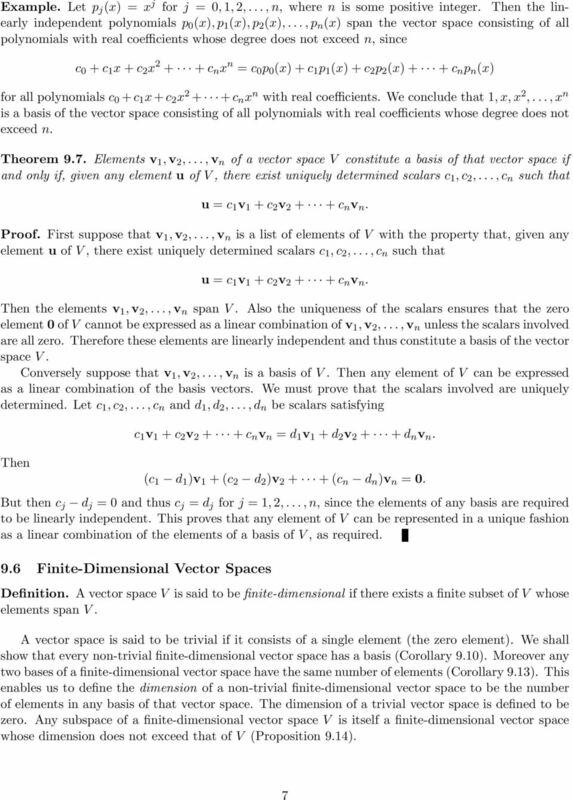 Definition So far we have studied abstract vector spaces. 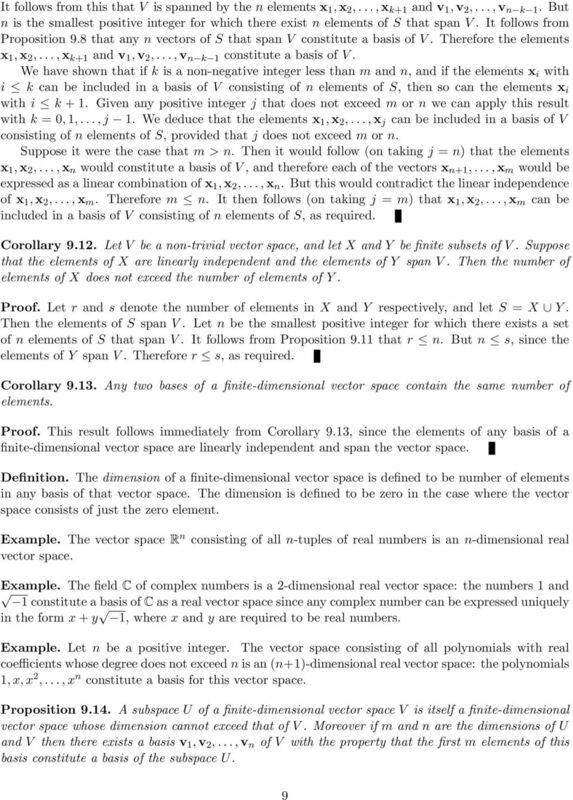 These are a generalisation of the geometric spaces R and R. But these have more structure than just that of a vector space. Practice Math 110 Final. Instructions: Work all of problems 1 through 5, and work any 5 of problems 10 through 16. Linear Codes. 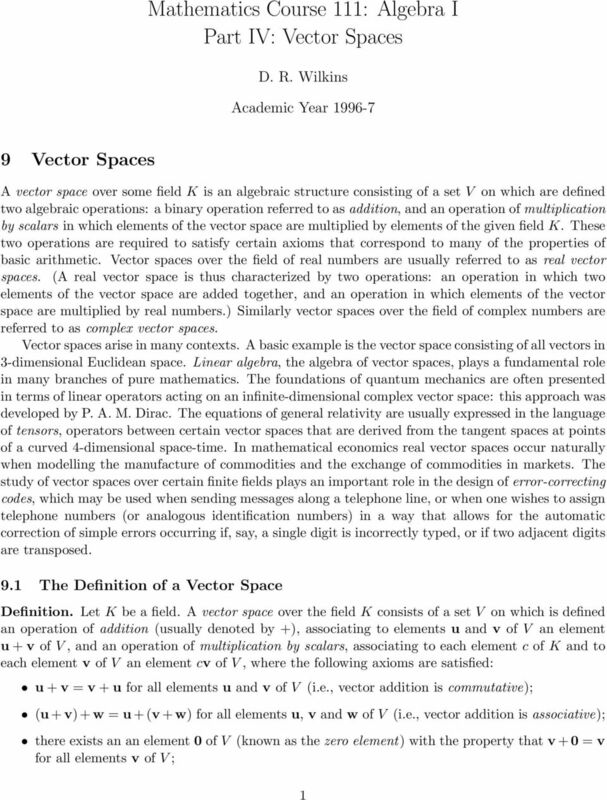 In the V[n,q] setting, the terms word and vector are interchangeable. MA651 Topology. Lecture 6. Separation Axioms. Appendix A Appendix A.1 Algebra Algebra is the foundation of algebraic geometry; here we collect some of the basic algebra on which we rely. We develop some algebraic background that is needed in the text. 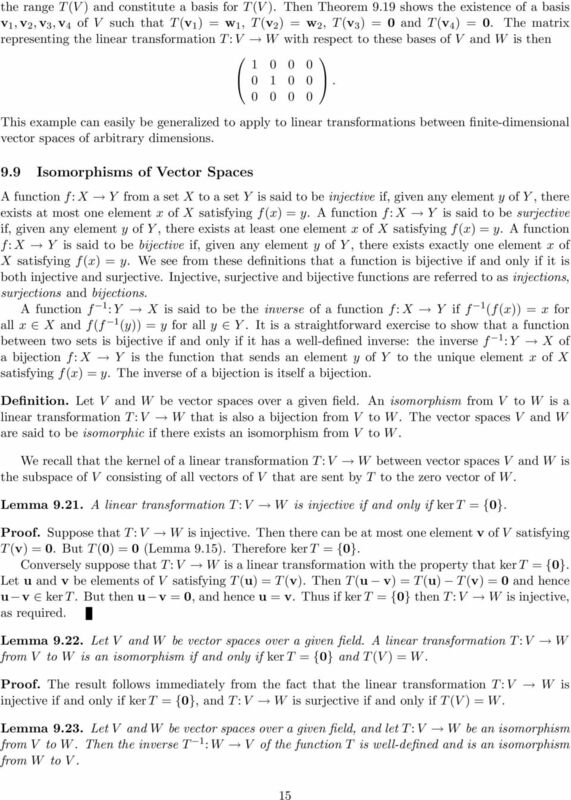 MATH 304 Linear Algebra Lecture 9: Subspaces of vector spaces (continued). Span. Spanning set. x1 x 2 x 3 y 1 y 2 y 3 x 1 y 2 x 2 y 1 0. 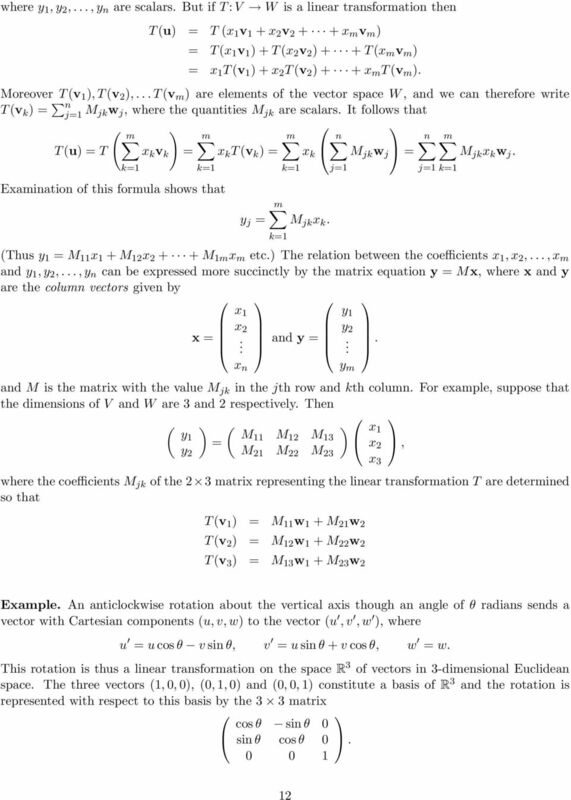 WHICH LINEAR-FRACTIONAL TRANSFORMATIONS INDUCE ROTATIONS OF THE SPHERE?